I thought today was a good day to take a trip down memory lane. 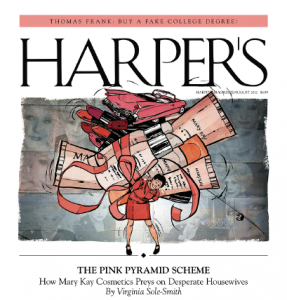 In 2012, Harper’s Magazine published an excellent article (the cover story!) 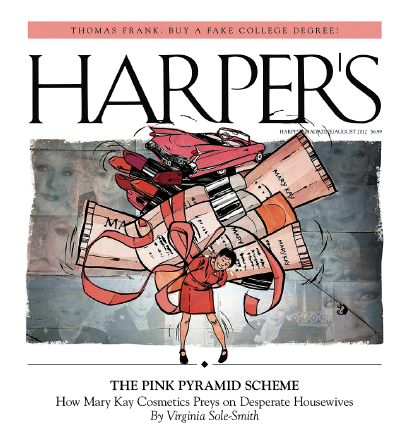 about the pink pyramid scheme known as Mary Kay: The Pink Pyramid Scheme: How Mary Kay Cosmetics Preys on Desperate Housewives. The story got tons of buzz, and there were spirited discussions about it all over the place. The story is as relevant today as it was then, as virtually nothing has changed in the world of multi-level marketing. Mary Kay supporters came forth to decry this story and claim it only reflects the experience of a few “disgruntled former consultants.” Sadly, we at Pink Truth know that is not the case. We know that almost everyone loses money in Mary Kay, and that there are millions of women who have had bad experiences at the hands of this pink predator. Gotta say, reading Pink Truth makes me glad at my inoculation early on. Being rather unpopular in high school, I was happy to attend a makeup party, as my host stated. I imagine either some sort of TV drama makeover sleepover session without the sleepover or an actual pampering near spa treatment. What I got was neither. We put on our own makeup provided by a woman who then asked us to buy things. This soured me to the whole idea of what I learned later to be MLMs. Oddly, if I was told up front what the party would be about – a product testing and sales party – I might have been more receptive. Part of my dour mood toward it was the deception of how I would get a “Treat” instead of a makeup purchase. Reading this site over, however, tells me how rare such honesty is, and honesty is a thing newer generations are valuing more and more. I hope that many other Millenials remember the savvy tricks we’ve had to learn in the digital age to dodge the amount of advertisements and too good to be true offers that MLMs make. I’ve seen it’s not true, but I hope as more experience it and open up to their encounters, more would get that sour feeling I got at that party. It’s so hard to believe this was five years ago. MK said that my story wasn’t believable because I didn’t use my real name (technically I just didn’t use my last name). Virginia and I ended up going on NPR and Corporate was not happy to have us tell our stories over and over. So if you’re reading, Virginia, thanks for making this happen! So if the business plan is so terrible and a pyramid scheme, why is it taught at Harvard Business?? It is NOT taught at Harvard. Shelby … Harvard Medical School teaches about Ebola and bubonic plague, but that doesn’t make them a good thing. There is a very big suggestion that “taught at Harvard” means “endorsed by Harvard” or “approved by Harvard.” Mary Kay is most certainly NOT approved by Harvard. The only two real connections I’ve heard about between Mary Kay and Harvard are these: 1. NSD Gloria Mayfield Banks has a degree from Harvard (which does NOT make her a Harvard spokesperson). 2. Harvard teaches business classes in Fraud Detection, which may have included Mary Kay and MLMs as a case study from time to time. It was only used as a case study by 1 group of students, so that is not the same as “studied by Harvard”. No one I know with an MBA has ever studied MK. Students can choose any company they’d like for certain presentations or papers, yet that does not mean Harvard University applauds MK as a business. I’ve seen a few case studies. My favorite was the one analyzing how MK Ash got women to work so hard for so little. But a case study about Bernie Madoff doesn’t make Ponzi schemes OK.
You’ll also want to know many people in MK boast that MK does not do animal testing, yet they do. For years, I heard NSDs like Kathy Helou say that, but it was only after I became a Director and moved up a bit before I got someone at corporate to admit it to me. I was gutted to hear it, and it added to my growing list of reasons why I had to resign and get completely out of MK. Lying, while saying you’re a Godly company, is the ultimate abuse of Him. In fact, some Harvard Law School professors think these pernicious lies might be grounds for a defamation suit. The line that shook me was from a director at conference saying it was selfish not to share the MK opportunity with others… She went on for about 10 minutes on how terrible it is to be selfish and that we NEED to be out there, selflessly dedicating our lives to the possibility that there is someone who will become a director because we said hi. After that, everything my husband had been saying started to make sense. The pink veil was lifted form my eyes. It is not selfish of me to spend time with family instead of hosting a party, I’m sorry that’s BS. This is just another way to brainwash people. Repeat over and over…shifting blame onto others for not sharing the opportunity. And when someone resists the “opportunity”, the up-line just tells the brainwashed IBC that the potential recruit “just doesn’t ‘get it’. ” Same with family, husbands, friends – “they just don’t get it”. Always shifting the blame. Never looking inward, at the opportunity itself and asking why it’s not working for you. I tried to sell Mary Kay for about a year. Most people think it’s too expensive. All I ended up with was a big inventory and hurt feelings. I honestly thought my recruiter was a friend but she dropped me like a hot potato when I told her I was quitting the business. I wouldn’t recommend getting involved with this company. You won’t make any profit and you will feel used once you realize it’s a rip off.